Friendly neighbors there, that’s where we meet! In today’s digital world, the experience of free play and make-believe pretend play – like the kind you see every day on "Sesame Street" – isn't emphasized enough. Play is brain-building. It's a central part of healthy child development, a key to executive function skills and a buffer against the negative impacts of stress. Play has been found to help with language development as well as math and social skills. Last month, the American Academy of Pediatrics released recommendations regarding the “Power of Play.” The academy says children who play at least an hour a day are more creative and better able to multi-task later in life. Despite these major benefits, play time has been declining over the last few decades. Families are tightly scheduled with activities such as piano lessons, basketball and Girl Scouts, not leaving much free time. Schools have also reduced the amount of time for free play. Approximately 30 percent of kindergartens have no recess. Play is still relevant. In fact, it’s one of the most important parts of childhood. Play is about learning and discovering. It’s how children develop emotionally, cognitively and linguistically. It is important to interact with your child and respond to cues and questions. There are a variety of experiences out there that don't involve screen time. It’s not about fancy toys. It's about common household items, plastic containers, pots and pans, and spoons to bang with. Respond to your baby’s smile by smiling and tickling his toes. Imitate your baby’s coos and babbles. Have a baby talk conversation. Show your baby a brightly colored toy. Let her bring the object to her mouth to explore and experience different textures. Make sure your baby has a safe environment to crawl in and explore. Use a mirror so your baby can explore facial expressions. Play peek-a-boo or pat-a-cake with your baby. If choosing a daycare, look for unstructured play time with various play centers through the classroom. Give your child empty containers, pots, puzzles and wooden spoons. You will begin to see imitation such as, stirring a pot and working on a puzzle. Give your child a chance to explore hispeers by visiting library story time or a playground. Have a dance party. Let your child explore walking backward, spinning and jumping up and down. Make-believe play is excellent at this age. Interact with your child by pretending with a baby doll or dinosaurs. Read stories and help to encourage pretend play based on them. Sing songs, practice nursery rhymes and play games such as Simon Says. Provide opportunities to sing and dance. 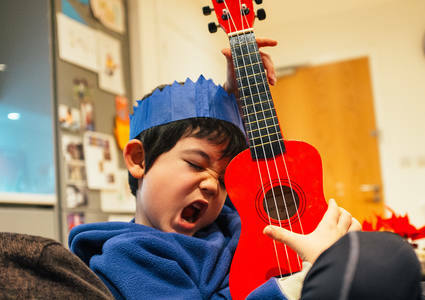 Give your child time and space to act out imaginary scenes, roles and activities. Schedule time for your child to interact with friends to practice socializing and building friendships. Allow for your child to move through space by hopping, swinging, climbing and doing somersaults. Limit screen time. Real “face” time – time with peers or parents – has far greater benefits to the child. Encourage your child’s school to offer recess and brain breaks throughout the day. Play games such as duck duck goose or tag. Next time your child asks you to play, jump at the opportunity and head outside! It will benefit both of you in the long run. 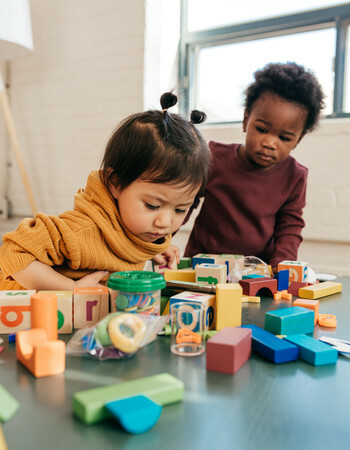 If you need more ideas on fueling your child’s imagination and opportunity for play, talk with your Methodist Physicians Clinic pediatrician. Pediatrician Dr. Elizabeth Walenz loves seeing kids grow as well as helping them lead long and healthy lives. She is especially interested in nutrition, growth and development. Dr. Walenz sees patients at Methodist Physicians Clinic Regency.